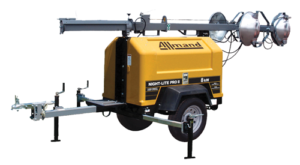 Allmand® and SolarTech® Gas-Powered Light Towers provide durability and performance you demand. Garden State Highway Products, Inc. (GSHP, Inc.) offers light towers from two manufacturers with many features, long and efficient run-times, and lower risk deployment. These light towers are built with durability and performance. View our selection below. Contact our Sales Team today to discuss your project! Call 800.338.5685 or email sales@gshpinc.com. The Night-Lite Pro II® LD-Series features SHO-HD® lamp fixtures that provide 135,500 lumens per lamp – more than competitive light towers. The 30 gallon polyethylene fuel tank prevents contamination from rust and corrosion to keep your light tower running longer. The optional full Fluid Containment System (FCS) protects sensitive environments from inadvertent leaks and spills. Maximize your jobsite productivity with the choice that outshines the competition. The Night-Lite Pro II® V Series® offers four different engine models and features a vertical tower with power cables encased in Nycoil™ flexible tubing to eliminate tangling and stretching of the tower wiring. 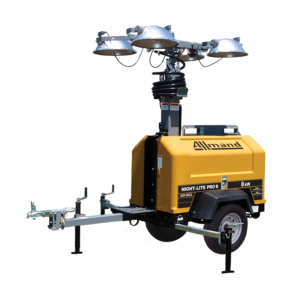 The SHO-HD® lamp fixtures provide 135,500 lumens per lamp – more than competitive light towers. With a 30 gallon polyethylene fuel tank, this dependable light tower will keep your job-site running all through the night. Whatever your jobsite needs, the Maxi-Lite® II V Series® can deliver, with multiple engine options and 542,000 total lumens of lighting. It features 100 gallons of fuel capacity to provide up to 277 hours of non-stop operation (with LED’s). The gull-wing style doors off er easy access to engine and generator, and rear control / outlet panel and remote oil and engine coolant drains make for easy operation and servicing. Built with a rugged trailer frame with full Fluid Containment System (FCS), hydraulically actuated tower and ability to withstand 65 MPH steady winds, this light tower will deliver the goods to get the job done right. The Maxi-Lite® II V Series® 6-Light provides 813,000 lumens of light from the standard 6 light arrangement. With up to 20 kW or power, this light tower has plenty to spare for powering up additional 120 or 240 volt equipment on your jobsite. 100 gallons of fuel capacity provides up to 227 hours of run-time (when equipped with LED fixtures). Standard fluid containment means you don’t have to worry about accidental spills damaging the environment, and the large rear drain makes it easy to clean out should an accident occur. 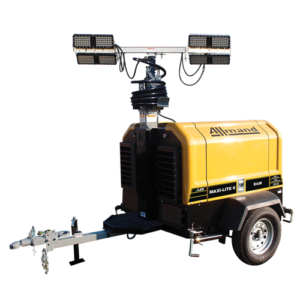 Combine all this with Allmand™ reliability, and you have a light tower that is hard to beat. or program the start / stop times to your jobsite needs. All this technology delivers the worry-free lighting for your team to focus on the task at hand. An ROI-driven solution, the Night-Lite™ V Series® is built with the efficiency, durability and performance you demand. It will run up to 155 hours between refueling (with LED’s), and has a convenient fuel fill neck for quick refueling. Plus, it offers 542,000 total lumens from the four SHO-HD® light fixtures and minimized freight costs because up to twenty units fit easily on a flatbed trailer. 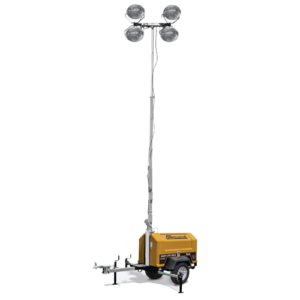 The SPLT-3000 is a portable light tower designed to provide a stable and adjustable base for outdoor lighting. This light tower is perfect to illuminate parking lots, storage yards, special events or any application where permanent lighting is not available or possible. No generator means a quiet, clean lighting system with no gas or diesel fuel to maintain. Included is an 4 or 8-Lamp Array of LED fixtures on an easy to raise 30 foot mast. The lights are directionally adjustable to provide a customizable field of illumination. 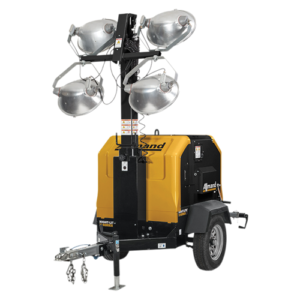 Easy to tow and set up, the SPLT-3000 Light Tower provides reliable lighting for a variety of needs. Three stage Telescoping and Rotating Mast of galvanized steel with inter-stage roller bearing technology and variable mast deployment height. Mast can be raised to any height between 13.5’ (min.) and 30’ (max.) and is stable at any height. ISO 9001:2008 Certified Design and Manufacturing – the ultimate in quality assurance.